So about 8 months ago we got a sweet and sort of naughty little puppy we named JJ, which stands for "Jackson Jr." (Jackson was a dog my husband had for close to 10 years who passed away back in 2012). Despite being a little overwhelmed with having two kids, and one dog already, my husband just knew our other dog Jilly, was ready for sibling. 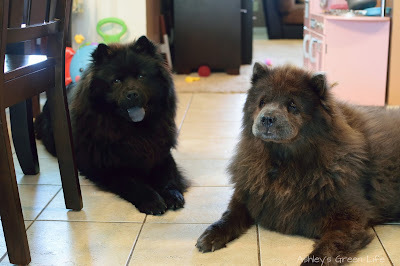 So after finding just the right one, a black Chow Chow, just like Jackson was, he brought him home and all was well or as well as it could be with a puppy...until we spotted some fleas on him a few weeks later. Could he have had the fleas when we got him? Maybe. But either that or us taking to long to start him on some type of "flea prevention" medicine or ointment, came back to bite us big time. The fleas spread to our other dog Jilly, and before we knew it, they were in our home...cue major freakout! 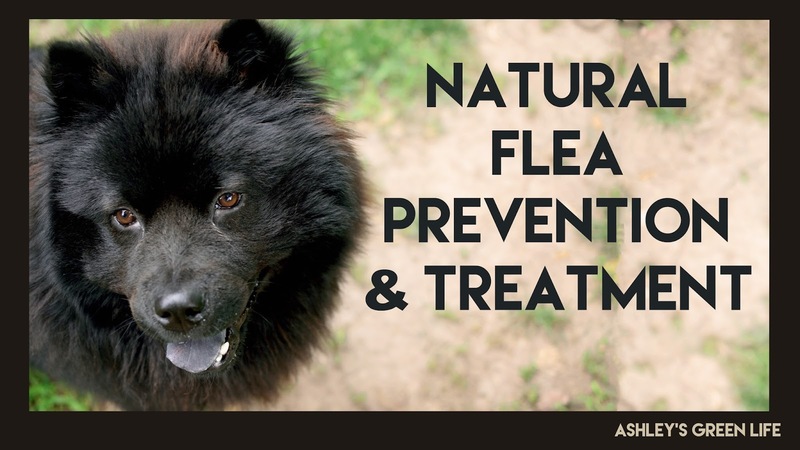 Now most preventative flea treatments and medications consist of treatments like Frontline, which you apply to your pet's skin every couple of months to keep the fleas away. But products like this contain things called organophosphates, which are what prevent and kill fleas on your pet (by interfering with their nervous system. The only problem is that organophosphates are incredibly toxic (literally, they are neurotoxins), not only to the pet itself, but also to those kids and family members living with the pet in how they could touch, pet, or just be in more contact with pets. (Read more here or here). Also, you can even check on the NRDC website how your preventative medicine ranks in safety by clicking here. I know my girls love cuddling with our dogs. In case you don't know, fleas are extremely small, and although they can't fly, they can jump from dog to dog, dog to person, carpet to person, etc. Aside from jumping, fleas also like to lay eggs. 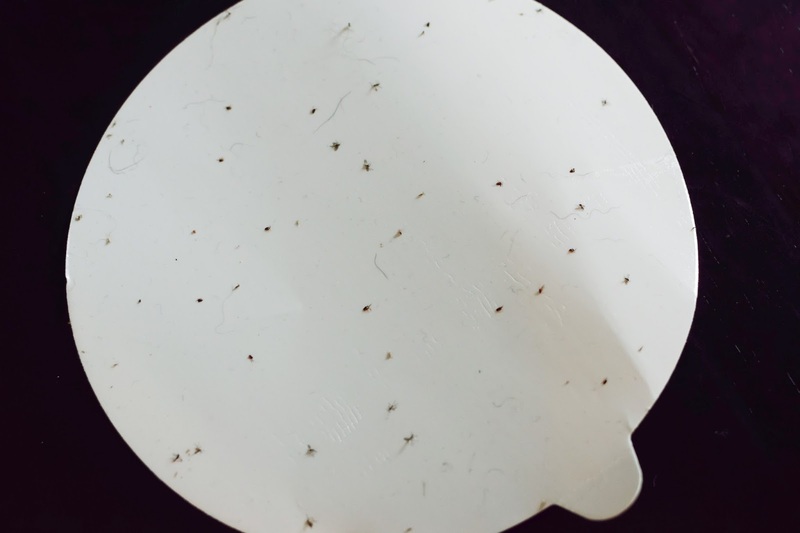 Female fleas can lay 27 eggs per day...making it near impossible to kill and prevent more fleas from infesting your house, pets, yard, and family! Even better, fleas can bite (since their source of food is blood). They like to bite the animals they live on, and occasionally people too. Usually these appear as small little red bumps on the skin around feet, ankles, and legs. Want to learn more about fleas? Here's and interesting link with graphics. 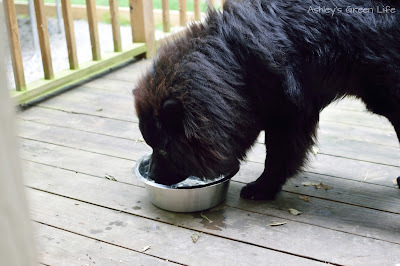 No if your pet currently DOES NOT have fleas, skip down to the section called "Prevention" at the bottom of the post to save some time, or continue reading now to hear all the things we tried and what eventually worked to help us get rid of the fleas. "Okay Mom, give them the rundown..."
When we first discovered the fleas, I went the natural route, like every green, tree-lovin blogger would do, I mixed up a nice little batch of essential oils in a spray bottle (something like this recipe with Lavender, Purify, and Peppermint...and I added TerraShield) and started spraying away. It did nothing. I gave it a night and still no sign of the fleas going away. 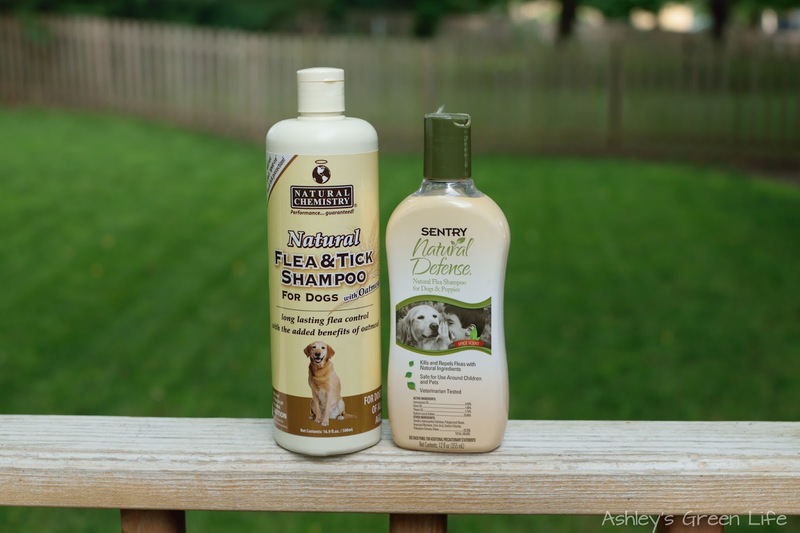 So we went and got an eco-friendly flea/tick bath soap (Sentry Natural Defense Dog Shampoo and then this one: Natural Chemistry-Natural Flea & Tick Shampoo). Awesome, wash them up and call it a day, right? Wrong. The next day we checked and although it helped remove the fleas on them at that moment, we didn't realize that by being back in our carpeted living room, they were just reinfested again. 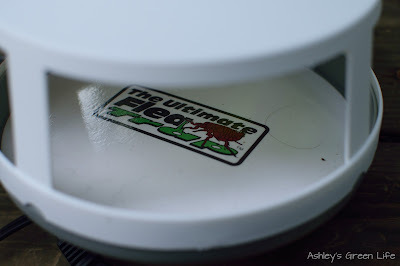 Luckily our "flea infestation" was never severe. Yes, my dogs had it, and it was in our home...but to someone coming in, it wasn't that visible...not like those nasty images you find when you Google, "Flea infestation". Eww! But no matter how small it was, it was still there and still on my dogs. Enough to make anyone go crazy. 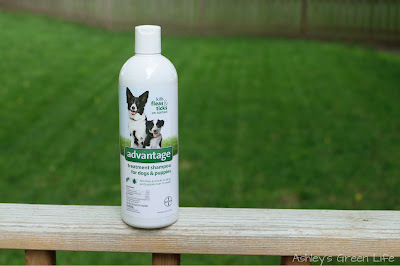 So I turned a blind eye while Brandon went and got a more toxic flea bath soap (Advantage Flea & Tick Shampoo for Dogs and Puppies). Again the fleas remained. 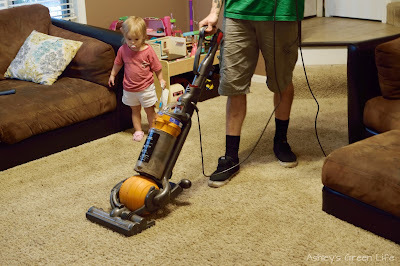 So knowing they were coming from the carpet, we got a "natural" carpet powder that you can put down, leave for a few hours and vacuum up (Sentry Natural Defense Flea and Tick Carpet Powder) This still didn't work and even worse: broke our Dyson vacuum! 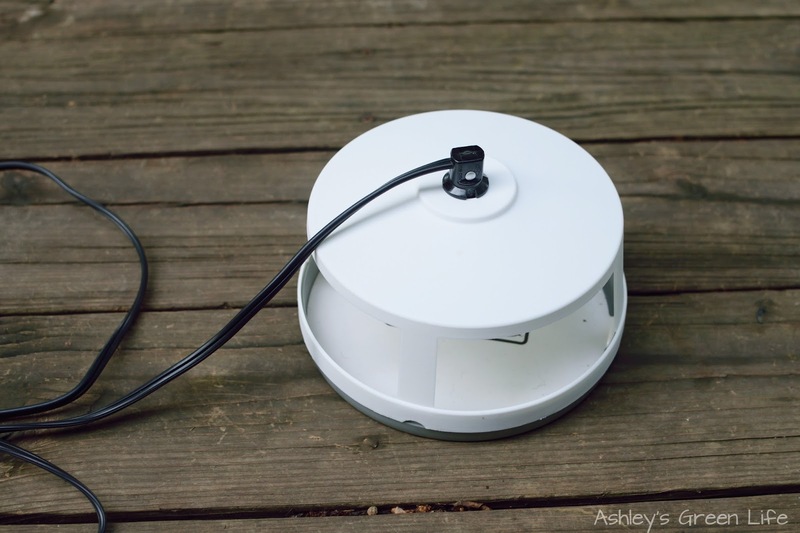 Luckily we were able to get it repaired, but a vacuum is key to getting rid of fleas so that really set us back. No picture of this lovely product, I threw it in the trash in a moment of anger! From that point on, it was kind of a blur. Here's some more of the products we tried and that failed. Had the carpets professionally steam cleaned, that would be a sure thing right? Wrong. They came back (thank you dogs even though we gave them a bath before they were allowed back on the carpet). 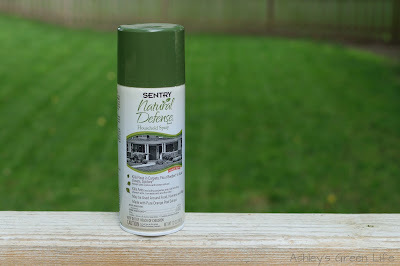 Had our backyard treated for pests/bugs- Surely this would help right? Maybe address the source of where they were possibly coming from? But still no luck. 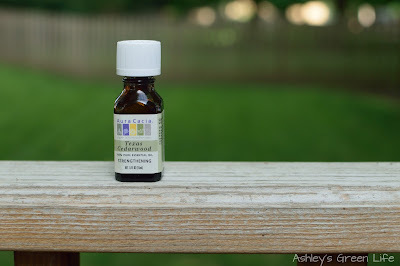 Texas Cedarwood Essential Oil- I really thought this was going to work, I mean fleas apparently hate the smell of cedar wood, but it didn't work. I only discovered that I HATE the smell of cedarwood now! Natural flea collars-(PetGuard Herbal Collar for Dogs) It was probably a little too late with these, I kept waiting to see the fleas just jumping right off the dogs, but it still did nothing except make them smell like potpourri. Shoo! 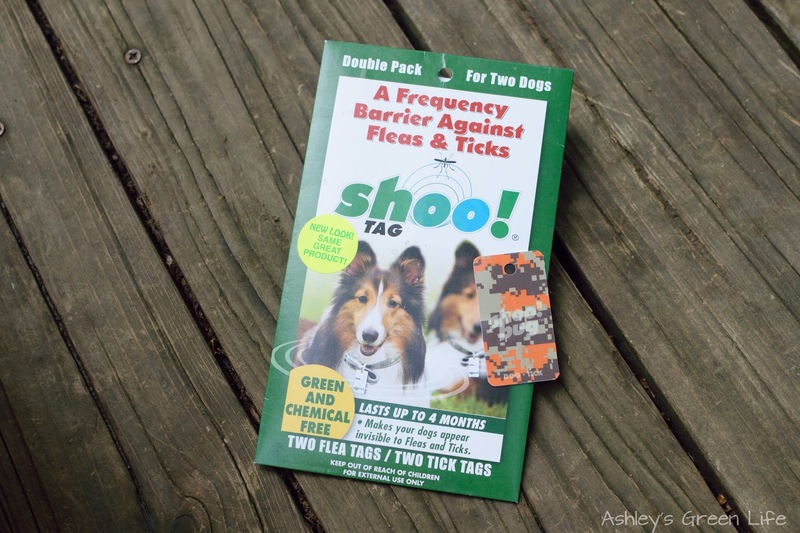 Flea Tag- This seemed really promising, a little chip that you put on your dog's collar and it creates a magnetic field that repels fleas...apparently. But it was hard to find directions on how to put it on the dogs. Inside the collar closest to their fur? Or on the dog tags? Lots of questions unanswered, and after a few days it still didn't work. 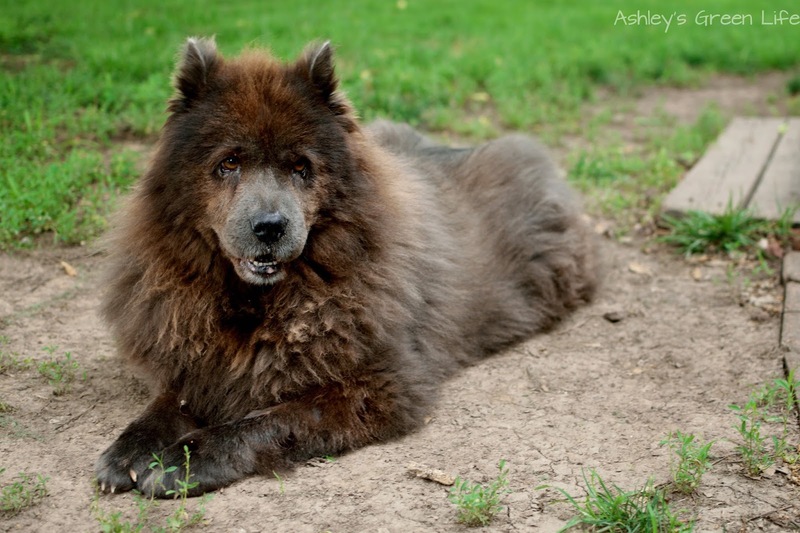 It's possible our dogs were a bit too hairy with all their fur? Guess we'll never know. (Read some of the Amazon reviews here). Flea light lamps- (Victor Ultimate Flea Trap)This seemed like a nice green option that would help solve the flea problem in the house/carpet. 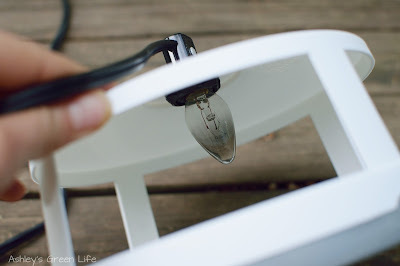 These are lamps that you put in your "infested rooms" and then turn off the room light, and turn on the flea light and since fleas apparently like to be near the light they will jump to the light and get stuck on a sticky piece of paper inside the lamp, thus trapping them. This helped for a few days, but then they didn't seem to want to jump anymore, or the paper lost it's "sticky-ness" and shortly after the bulbs burned out. Bummer. As you can see they caught hair and one or two little fleas in this lamp. room where it has more fleas. not quite the goal we were hoping for. Last but not least, I actually talked to a local pest control company about the possibility of them "spraying inside our" but the thought of it made me sick. Spraying toxins and pesticides right where my girls play with their toys and sleep in their beds...I knew I was desperate, but there had to be a better way. 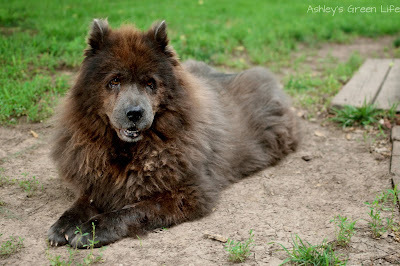 One day the stars aligned and I was googling my "No-Poo Shampoo" post (to send someone a link) and a product popped up: "Ashley's Green No Flea". This threw me for a loop, given the name of my blog, so I clicked it. It turned out to be a natural flea prevention product that goes into your pet's water and it prevents fleas naturally by making them become offensive to fleas and ticks, but not to humans. 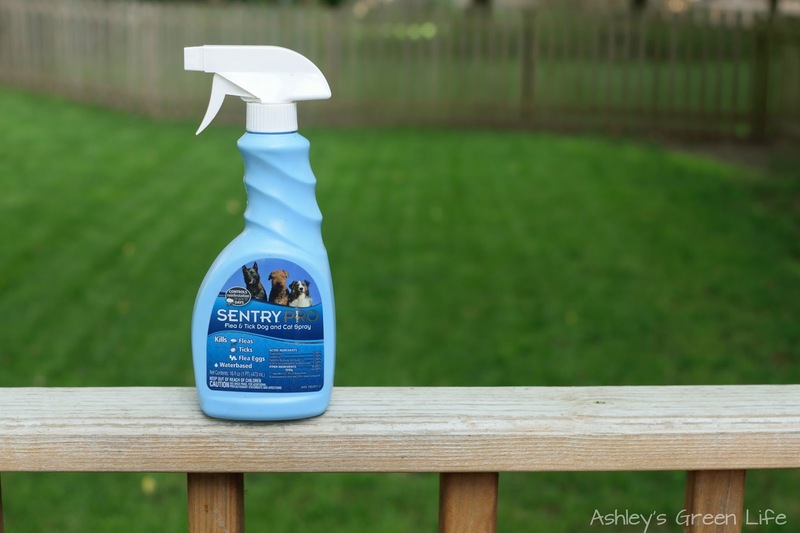 The solution you add to the pet's water is made up of vinegar and garlic, and when you add it to your pet's water on a daily basis it can prevent fleas and ticks in a healthy and green way over the long term, so you never have to buy Frontline again! I was sold instantly, and purchased a bottle. It was torture waiting for it to come, but when it did I put it right to work on our dogs. I had a plan and I was ready to make it work. 1. 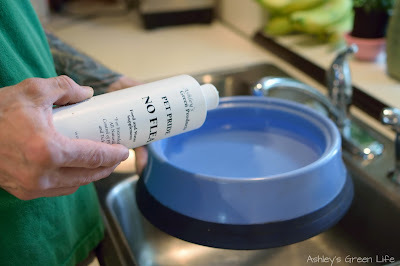 Put the "Ashley's Green No Flea" product in their water, every day, every time their water gets filled up. 2. Continue vacuuming the house DAILY. Looks like Mila is ready to be Daddy's vacuuming assistant. 3. Give them a bath in the eco-friendly flea wash once a week (washing them too much can wreck havoc on their fur and skin). 4. Continue washing all of our bedding every 2-3 days with hot water (just as a precaution, since fleas could jump onto us and get in our bedding). 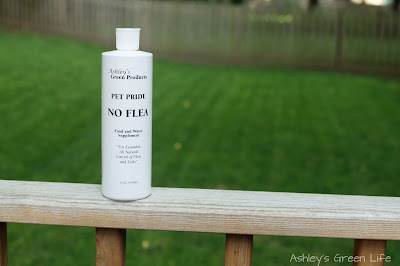 The downside to the "No Flea" food and water product is that it doesn't work fast. It actually takes 6-10 days to start working, but since I had exhausted all other options, I was game. But wasn't long before I started to see the fleas less and less. And within a week or two, the fleas were finally gone. We were exhausted from the daily vacuuming, and frequent laundry loads of bedding, but it was worth it in the end. Although it could have been any number of treatments that finally got rid of the fleas, I truly think it was the Ashley's Green No Flea Food and Water Supplement because it addressed the source: the dogs and by making them offensive to fleas the fleas no longer had a food source and as a result: we no longer had fleas! 1. Add 1 Tbs. of No Flea food and water supplement to 1 Quart of water each time you fill up your pet's water bowl. That's it. As you see in the video, we are so used to the amount that we just kind of "eye it" and since our bowl is a little over a quart, we use a little more than 1 Tbs. to adjust. I wondered if my dogs would be skeptic of the taste of it, but it hasn't seemed to affect them, since they drink it right up. Also if your dog has an outside water bowl, you'll want to add the No Flea product to that as well. The downside to this method is that you will want to keep a supply of Ashley's Green No Flea on hand at all times to keep the fleas away, but you would have to do that with any other treatment plan you were considering, so at least this one is a little cheaper, and much healthier for your dog and your family. Good for all pets from dogs (even puppies), cats, goats, even hamsters and horses (just adjust the dosage to fit their body size). If you're not interested in trying the No-Flea Product, one last thing you could do would be to have your pet take an internal flea prevention medication. 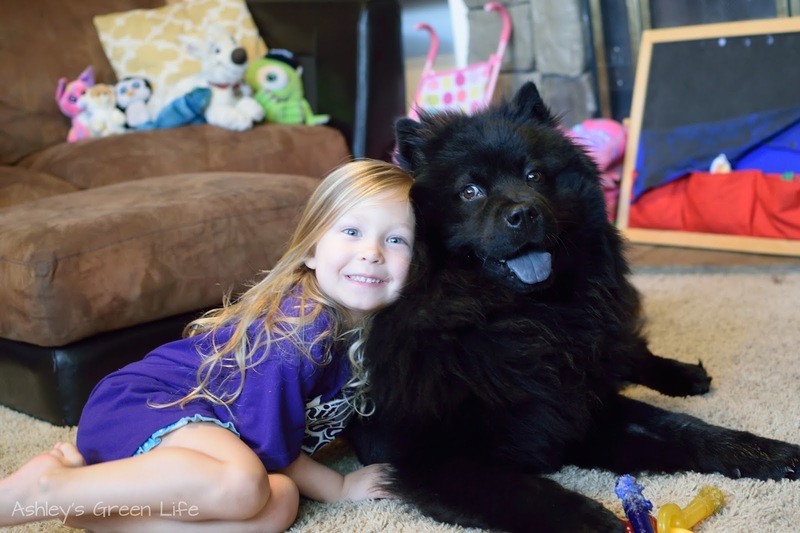 Although not the greenest option, it is safer for the children and other family members your pet will come in contact with so that they don't have to be exposed to the traditional toxic flea ointments by petting or being near the pet. So just something to keep in mind. 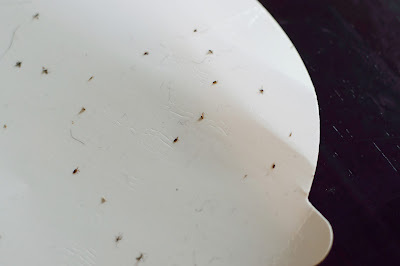 So now that you're skin is crawling, I know mine is as I try not to remember those flea-ridden days of the past, feel free to share your experiences with fleas. 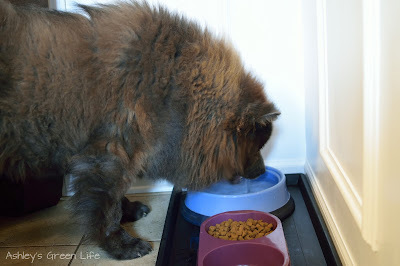 Has you dog or pets ever had them? How did you treat them? Do you have any natural treatments that worked for treatment or prevention? Share below and we can all learn and keep these little bugs away! "Goodbye greenies and goodbye fleas!"